Hello - welcome to my website! I'm a painter based in Newquay, Cornwall and on the north coast of Brittany. I sell a lot of work direct to you, so please Contact Me if you'd like more info. 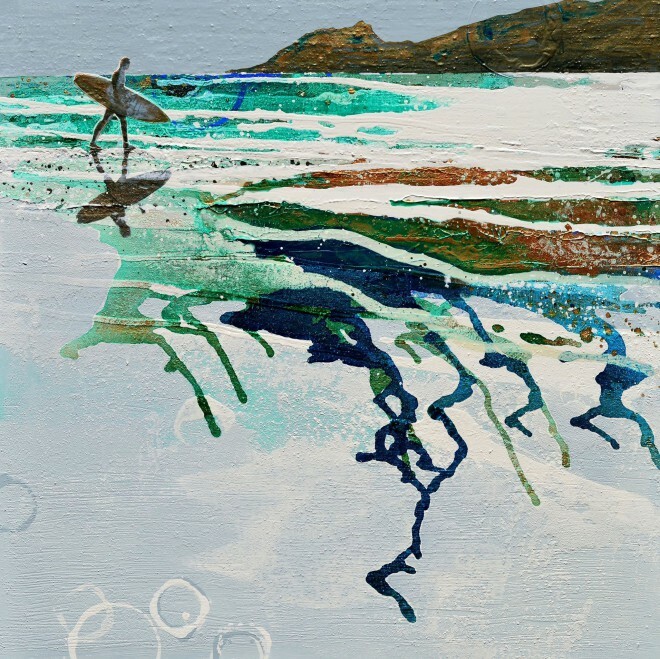 For the last 4 years, Melanie has had the pleasure of exhibiting her work at Saltwater Bistro/Cafe at Polzeath where she displayed paintings inspired by surfers, the sea, the sky, and 'the surfing scene' at Fistral Beach, Constantine Bay and Polzeath, North Cornwall. Sadly for Melanie, and for all those who enjoyed John, Kim and Steve's hospitality, Saltwater is no longer open. However, you can contact Melanie direct if you are interested in any work exhibited at Saltwater or, indeed, any work shown on this website. Melanie thanks John, Kim, Steve and everyone at Saltwater for their support over the past few years and wishes them all the best with their future endeavours.